Setting up a conference call is simple and easy. Ooma Office users can get started by placing the first call on hold, dialing a second number and hitting the conference soft key on the phone (if you already have a second call). 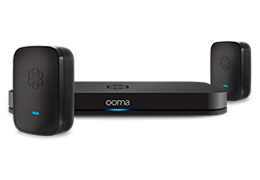 You’ll receive a free conference bridge and conference number with each Ooma Office account. Each conference bridge is built with 10 individual rooms and each room can hold 10 callers simultaneously, making calls and meetings much more streamlined for small businesses and offices. If you want to learn more about conference bridge options with Ooma Office, check out a more comprehensive list of FAQs by clicking here.